Brechin City missed the chance to take over at the top of League One when they went down 1-0 at Airdrieonians. In an evenly balanced contest, Adam Brown had an early opportunity for Airdrie, then Andy Ryan almost broke the deadlock shortly before half-time, but Brechin suffered a setback at the start of the second half when Alan Trouten had to go off with a hamstring injury. 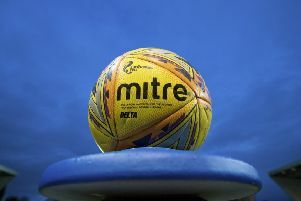 The disruption hurt Brechin and Airdrie took the lead within a minute when Iain Russell netted with a 54th-minute penalty after a handling offence. Brechin were reduced to ten men when captain Paul McLean was shown a straight red card for a wild challenge on Jack Leitch. Albion edged Stranraer 3-2 in a five-goal thriller at Cliftonhill. Albion looked the more threatening in the early stages and it did not take long for them to get their reward. Ross Stewart eluded the Stranraer defence and calmly placed the ball out of Cameron Belford’s reach to put the home side in front. Stranraer equalised when goalkeeper Ross Stewart seemed to misjudge Willie Gibson’s shot and the ball found the back of the net. But Ryan Wallace put Albion back in front from the penalty spot as half-time approached. Joe Nuttall’s perseverance paid off as he equalised with a terrific volley after 71 minutes. Albion went back in front when Wallace’s free-kick beat Belford with the aid of a deflection. In a stalemate at Hampden, Queen’s Park and Peterhead finished 0-0 with Peterhead finishing with ten men after Simon Ferry was sent off five minutes from time.